DECEIT, DECEPTION, AND MURDER... everything we love. If you’re looking for a summer mystery that’s likely to get you cheered up, in spite of murder and risk, and will find a way to have the forces of good triumph (or at least get kissed? 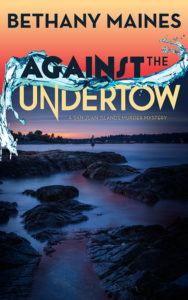 ), pick up AGAINST THE UNDERTOW. I loved, loved, loved these two books. It’s a series I hope goes on forever. Loved this book! I really couldn’t put it down … Ms. Maines has a very good sense of humor and the main character, Tish, really appealed to me. 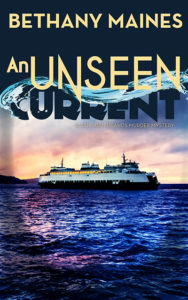 I loved the setting, and even though I haven’t been there from the descriptions in the book it was easy to imagine myself in the San Juan Islands in Washington state. I can see that this will make a great series with original characters and many fun situations to entertain me/us. I am very much looking forward to the next book! Hopefully there will be a series? I loved this book, it was full of quirky characters, a stubborn deputy, and lots of plot twists. This book was wonderful! I purchased it as an unknown, and it was the best surprise. Sometimes we just get lucky. Very nice humorous touches with realistic situations. Tish and Tobias are a wonderful granddaughter, grandfather combo. I hope that this storyline continues on. It is difficult to stop reading the book once you start. If you appreciate a fascinating, cleverly plotted, entertaining mystery with numerous twists and turns, making it a delightful read, this book is for you. I’m looking forward to reading of Tish’s adventures as she acclimates to Island living. I really enjoyed this book especially for the writing style. This is my first time with this author and since the new book in the series is coming out in June I had to buy this one and I’m sure glad I did. Well written and edited. What I enjoyed the most is the realistic interactions & dialogue between the characters. The dialogue was very blunt and sarcastic at times but was very true to life and made the characters very real. Really liked Tish and her 78 yr old grandfather Tobias who is former CIA and their relationship. Tish’s previous acting career comes in handy when she is talked into helping find out who murdered Tobias’ best friend. Lots of humor and suspense made it a very fun & interesting read. This book will keep you guessing until the end! It reminds me of the Stephanie Plum mysteries – I couldn’t stop laughing the entire time I was reading. Christmas is a lot more dangerous than it used to be. Graphic designer Violet Harper is usually found at her local Starbucks. Handsome Roman Knox is usually carrying a gun. But tonight they’re both in a bank and there’s a body on the floor. It’s a mess, a robbery and almost the worst day ever, but maybe a Christmas miracle can get them out of the bank and into love.